A publication which works like a travelling exhibition/think tank, based on the interests and concerns outlined below. This is able to fit into a number of environments, from galleries to work and educational settings. This will aid further ideas and developments. 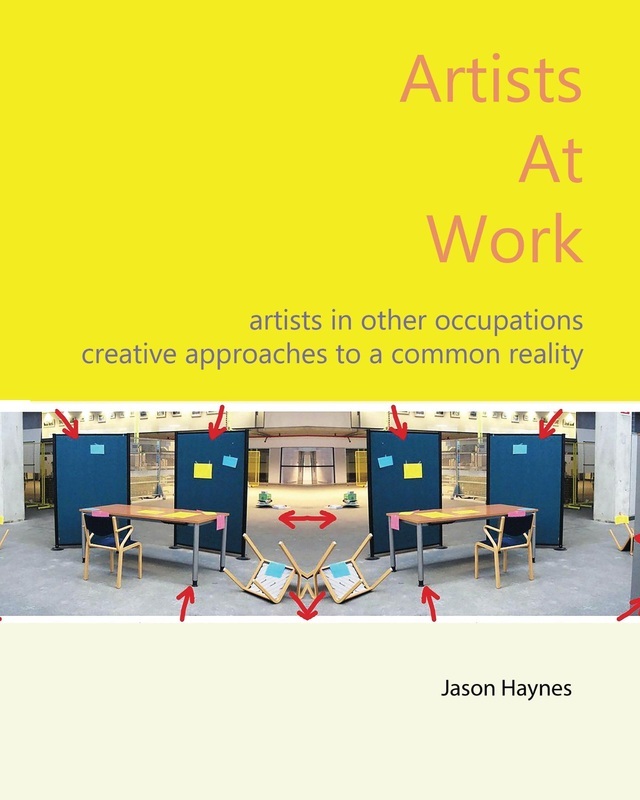 "This book focuses on artists who use secondary employment to influence their activity. Whether supplementary day jobs in call centers or placement opportunities bringing change to the work place. Potentially challenging, reflective or insightful; these artists express different approaches in their disparate disciplines towards ‘making a living’. The artists here represent a real diversity in today's working environments and concerns; from factory and office work to inner city schools and human rights issues. An ongoing narrative accompanies this, seeking to address thoughts on overlapping identities and roles whilst also aiming to offer a more personable and accessible read. Relevant comparisons with artists from the wider history of art is also reflected upon, in order to offer up alternative contexts in a common ground of understanding.This book analyses these approaches and seeks to understand the potential movements and boundaries for the artist in contemporary society." Agreed to have publication in their artist led library and shop, alongside my ongoing zine contributions. concerning artists and employment. Organised by 'Collaborative Research Group'. selling arti﻿st books, zines and publications. ​who feature in the book and collect and support work made by artists. This gives me two (intensive) months to finalise and edit the written drafts. A publication is seeking artists in part time or full time employment who have used secondary employment to influence their activities or a particular piece of work. Any medium or artform is acceptable, but please note this will be shown in print so you will need to include some visual support or evidence of the work. The entry is open to interpretation for example, as a critique, celebratory, representative or exploratory and can be indirectly approached, so long as a link to your other employment can be found. If selected you will receive a copy of the publication with your work in it and remittance for any additional opportunities generated. Understands many artists require second incomes to support their practice and is interested in those who use their supplementary ‘day jobs’ as a source for their own practices or direction. In doing so it aims to establish an alternative approach to this situation where the two professions may be blurred or collaborated in new or interesting ways, as well as reflecting on current trends or situations for artists and employment today.